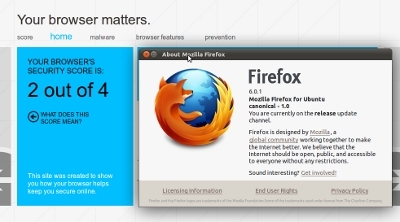 Microsoft launched a website named as Your Browser Matters for checking the security of your browser. Whenever a visitor browse the site, It judge the browser security and return the score out of Four points. The score is based on the protection over the Security risks such as phishing,malware and some other threats. Looks like Microsoft launched this web application in order to create public awareness about the browser and Internet risks. When i visit that site through my Firefox 6, it displayed 2 out of 4. For google chrome it shows 2.5 out of 4. I come to know that IE9 have 4 out of 4 score(i never used it). For IE7 , it is 1 out of 4. It refused to rate safari browser. How the Grading System works? Internet browser must give protection against the Malware/Virus Downloads by restricting malware distributing websites. Microsoft developed IE9(Internet Explorer 9) with this protection. IE9 scored 1 point here. But Mozilla and Chrome scored 0. Securing Extensions and an Effective Sandbox; also includes points for auto-updating, and a restriction for extensions and plugins. IE 9 = 1 point, Firefox = 0.5, Chrome = 1. There are a lot of options here including blocking insecure content on webpages (which is kind of more annoying than what it’s worth, in my view), sanitizing HTML, and protecting against “Clickjacking.” IE 9 = 1 point, Firefox = 0.5, Chrome = 0.5. So the total score for Firefox=2 ,Chrome=2.5 ,IE9=4.